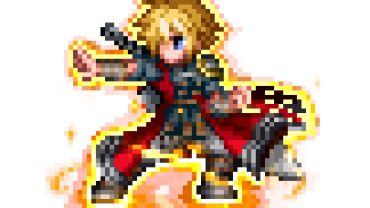 Conrad is a 5-star unit that plays the Physical Damage roll. His stats are pretty decent and he’s well set up with his interesting skill layout. Conrad is an interesting physical damage unit having a lot of qualities for damage but also some for laying down Support as well. His equipment is amazing having access to most of the weapons and armor giving him a variety of damaging methods. His skills are set up with a decent amount of damaging attacks, mostly physical but one magical as well. And most of his skills have secondary effects tacked onto them for some added kick. Outside of his damage, he has Analyze which is good for getting info on enemies, a healing skill, and Random Sample. Random Sample is an interesting move that randomly gives element debuffs to enemies depending on what it lands on. Conrad also has a conditional skill Booby Trap which is activated by his counter trait. So this can be an added bonus when the counter chance goes off at a good time. All in all, Conrad is actually a pretty good 5-star. His equipment loadout is what really makes him stand out from having so much. Verdict: A good 5-star with a good skill layout and great equipment. Conrad is neutral to all elements and status ailments. Conrad can equip 9 weapons and 8 armor. The current head of a noble family from Zoldaad. He watches over the treasured blade which was handed down through his family. The strange blade he carries on his back is said to vary in power depending on the strength of the memories of he who wields it. And so it is told that this treasured blade has the power not only to vanquish foes, but to change even time itself.